Operation Angel is a program designed to help people with addictions ranging from cocaine to alcohol get help. Historically, law enforcement has addressed the problem of drug addiction by simply placing the addict in jail, feeding a stigma that keeps users from seeking help. Today, as leaders of our community, we are taking a stand to help citizens suffering from addiction to get the help they need. 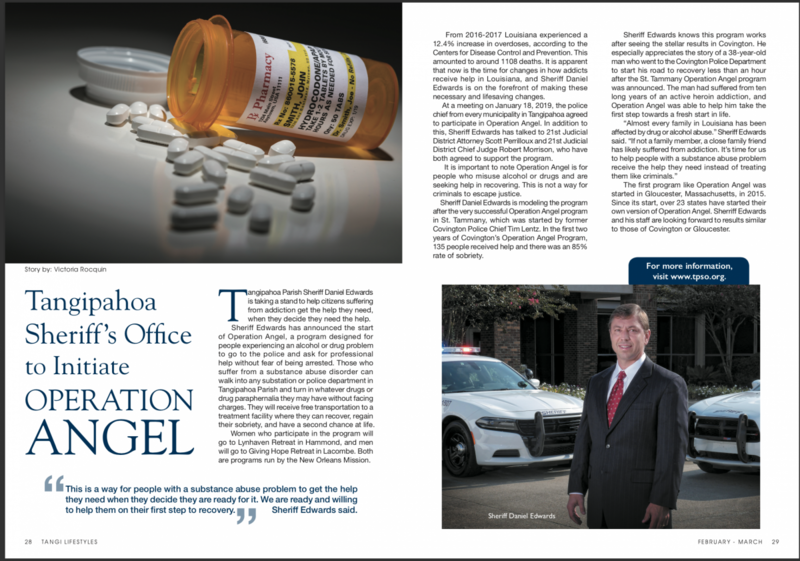 The Tangipahoa Parish Sheriff's Office and our partners join a growing number law enforcement agencies across the country who are working towards a collective vision where non-arrest diversion programs become a standard community policing practice across the country, thereby reducing overdose deaths, expanding access to treatment, reducing crime, and increasing trust between law enforcement and their communities. Tangipahoa Parish will become the third parish in Louisiana to adopt this new approach. Those who suffer from a substance abuse disorder and want treatment immediately can walk into any sheriff's office substation or police department in Tangipahoa Parish and turn in whatever drugs or paraphernalia they may have without facing charges. They will receive free transportation to a treatment facility where they can recover, regain sobriety, and have a second chance at life, for NO CHARGE. Women who chose to participate in the program will be taken to the Lynhaven Retreat in Hammond and men will be taken to the Giving Hope Retreat Center in Lacome. Both programs are run by the New Orleans Mission. Participants must be 18 years of age or older and want to begin a life of recovery. If you are seeking help after normal business hours, please dial 9-1-1 and they will connect you to the appropriate law enforcement agency.